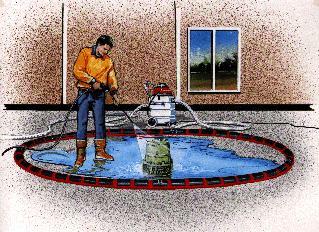 Water containment and capture when using a pressure washer is carried out by using a containment apparatus that is portable and covers a flat ground. The portion to be covered is enclosed by a fundamental berm, which marks out the area in which the wash water will be contained. Assembled twin ramps enable the access and exit in the containment without affecting the berm or the portions covered by it. There is a pump system for this as well that segregates oil and water or the materials before they get discharged into the sewage. The water containment systems also have heating capabilities so that they can be used even in extremely cold climates. So when using pressure washers in order to enable water containment and capture, ensure that the Vacu-Boom system has been engineered. It is used in a range of industrial and commercial applications in order to contain or capture the chemical and fluid waste. It is a pioneering and realistic wash water containment method to stop any run-off from washing action indoors and outdoors. The vacu-boom is a flexible tube, which is hollow, and five inches in diameter. It is placed on a hard surface to acts as a dam and surrounds the area of wash or containment. The open side of the boom is downwards since it is a C-shaped cross section; the bottom edge has small liquid inlets to draw the water into the wet vacuum recovery unit, which is possible because of the 25 ft vacuum hose. It is used on surfaces made of concrete, asphalt, wood and steel, basically any hard surface. It is simple and quick to set up. It contains and captures and extracts any liquid spill, part of the system also enables segregation. It can be used on hazardous and flammable liquids as well. The materials used to make Vacu-Boom are anti-absorbent, which means that after every use they can be washed. The system is tolerant o acids, petrochemicals etc. The boom has a basic element that is five foot, the sections are held together by clips and they form a number of lengths and shapes. They have unique fittings known as end caps for closing the vacuum ends and hose connection points. Other configurations include fittings like center-taps and squaring corners. The Vacu-Boom is very convenient to use in water containment and capture when using a pressure washer since the laws are very strict in waste discharge and it helps in draining such waste if the level of contamination is below the permissible level. If not, it has to be treated and then drained in the sewage system.